Cockroaches leave chemical trails in their feces as well as emitting airborne pheromones for swarming and mating. These chemical trails transmit bacteria on surfaces. Other cockroaches will follow these trails to discover sources of food and water, and also discover where other cockroaches are hiding. Thus, cockroaches can exhibit emergent behavior in which group or swarm behavior emerges from a simple set of individual interactions. 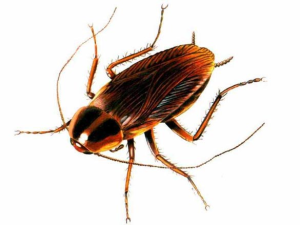 Cockroaches are one of the most commonly noted household pest insects. They feed on human and pet food, and can leave an offensive odor. They can also passively transport microbes on their body surfaces including those that are potentially dangerous to humans, particularly in environments such as hospitals. Cockroaches have been shown to be linked with allergic reactions in humans. One of the proteins that triggers allergic reactions has been identified as tropomyosin. These allergens have also been found to be linked with asthma.